Bake in the oven meals are always the best, especially casseroles, I personally adore them. 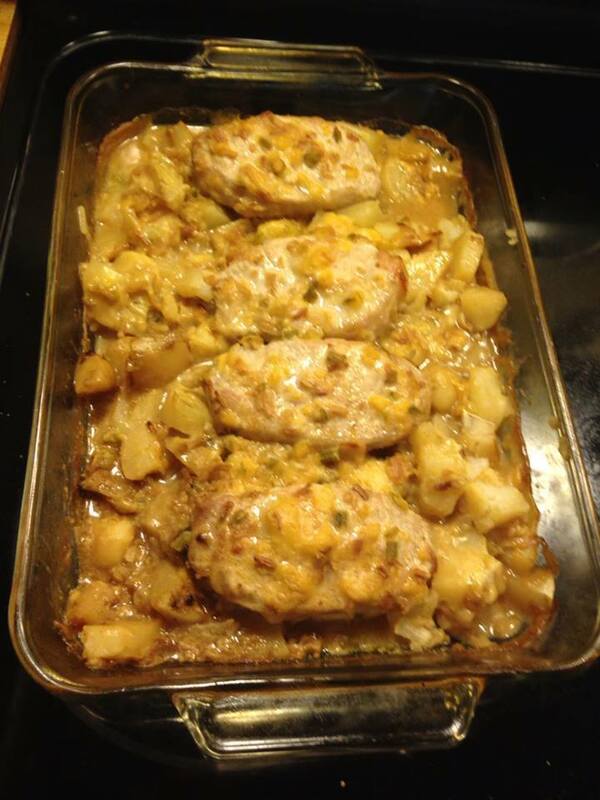 Today I’m presenting you a pork chop supreme recipe, I hope you like it. Nothing was in the fridge to cook except pork chops and I was dreading it since pork chops were just comsummed for dinner a week ago. I popped onto allrecipes.com hoping to find something superb I could whip up with ingredients already in my pantry. I stumbled upon this and my family went BESERK! They loved it! I did it, moist and delicious! I omitted the ketchup but WOWOW the brown sugar was definitely a huge plus, it even made the onions sweet and tangy and good and my kids never eat the onions but they did tonight!!! Defintely a keeper in my own recipe book! 4 thinly sliced medium potatoes. 1 envelope of Lipton onion soup mix.